And who says I won’t start with the BEST first? Valrhona Marsbar Cronut = Valrhona Cream Filling + Salted Caramel Glaze + Valrhona Choc Crumble on top. IDR 20.000++ (means, IDR 24.000 nett). Order minimum 3 hours in advance, by phone to (021) 52964960 and pick them up at Publico Jakarta. Address below this post. I won’t describe much about the flavor. I hope the above photo & description is enough to make you drool especially if you’re more of a chocolate than vanilla person. OH COME ON IT’S VALRHONA CREAM FILLING + SALTED CARAMEL GLAZE + VALRHONA CHOC CRUMBLE ON TOP. ON A CRONUT. And the best part was, the sweetness was not overpowering as I originally thought it would be. I lied. The best part was actually the texture. I was quite surprised that when I cut them in half with a proper serrated knife, it looked not too far as advertised. You know, when you see pictures on the internet and thought “Well.. It must have used some kind of photoshop magic or the best food stylist out there to reproduce that kind of super-good-looking food” – then no, it was closely similar and I was super happy and didn’t feel cheated at all. 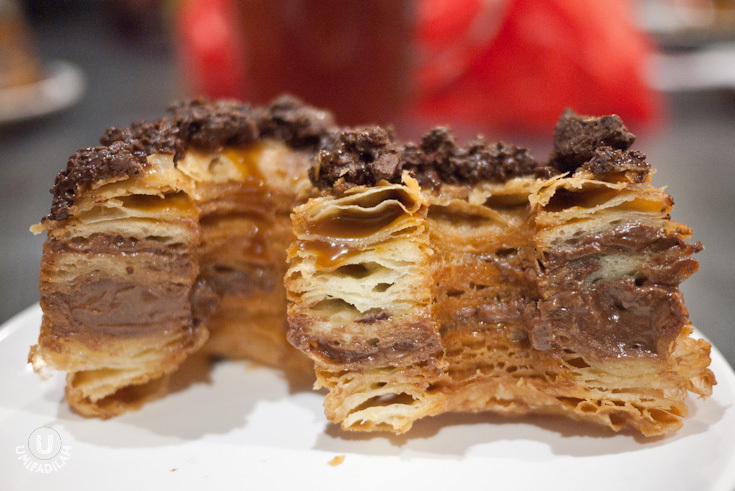 The actual Valrhona Marsbar Cronut. Oyeah. I repeat, the texture. At first glance, Noshbakers’ cronut looks taller and more ‘sturdy’ than Mandarin Oriental’s (MO) Kronut (oh and it’s heavier too). And when you cut them open, the pastry layers are very clearly separated with each other and the Valrhona Cream filling is quite all over the middle part. When I took my first bite, I even heard a sound of crunch! Yes, it’s how croissants should be – flaky, but also delicate. And when paired with other elements, the cream, the salted caramel, and the crumble on top..... man, I just had to close my eyes to enjoy them. A nice interplay between the flaky cronut pastry and the abundance of its cream filling, and then we also got salted caramel that tones down the overall sweetness, and another crunch from the chocolate crumble. No wonder they named them Valrhona Marsbar Cronut. It is in fact, like eating a marsbar on your right hand, and cronuts on your left. Genius interpretation and well-done execution, compared to MO’s that tasted more like just-a-fried-doughnut now. I just hope they will always be consistent in the near future because I’m not lying a thing about everything I experienced back then. Keep it up, Nosh! Jalan Senopati No.65 Kebayoran Baru, Jakarta. Selatan. 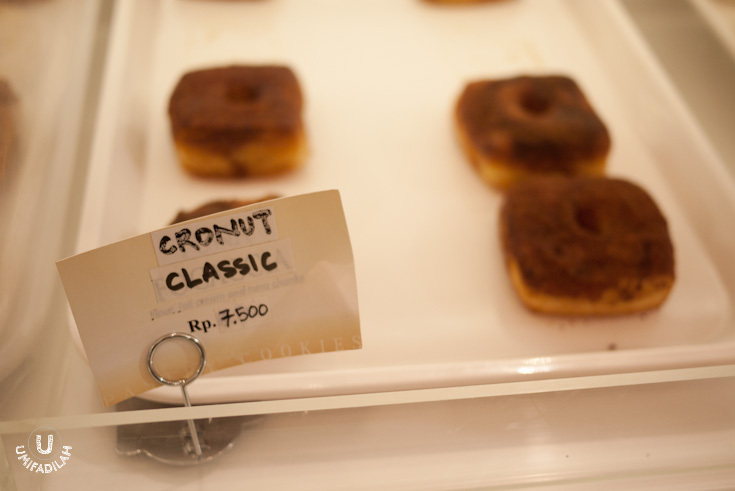 BTW, FAIL CRONUTS DO EXIST. I won't make a separate review about Goldfrance Bakery's cronut in Pasaraya Blok M because it's simply..... NOT a cronut :| With only IDR 7.500 a piece, its texture is nowhere near other cronuts I've tried before. Sorry to say but it's more like a #fakenut, no croissant layers whatsoever! Geee, why even bother to name them 'Classic Cronut' if what they're selling is, a matter of fact, only a flat deep-fried bread dough rolled in cinnamon & sugar? 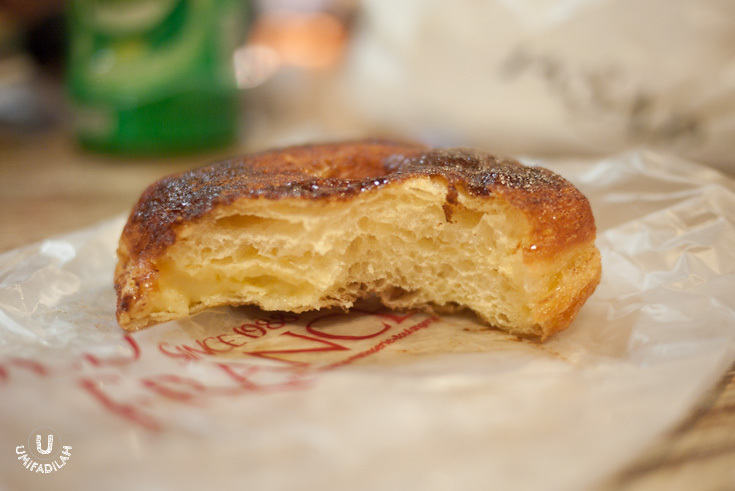 Stick to Noshbakers' Cronut in Publico for a safer option, people. Just making sure you don't get fooled with #fakenut. Stay tuned for my review on Cronuts Hunt Part 2: Union's Flaky Doughnut. (As seen here).